Emily, volunteer at our Thailand turtles programme, conducted this amazing interview with two Thai fishermen in March 2016. They are conducting the Tha Pae Yoi Turtle Head Start Programme which is not linked to our project, however is something that our volunteers may have a chance to get involved in. Both fisherman were born on Phra Thong Island and were at school when our Thai partners started the awareness programme in local school over 20 years ago. Were you born on Phra Thong Island? What was your view of turtles when you were young? Yes we were born here, we are 24 years old. There were many turtles on the island then, and we saw them on the beach regularly. We saw Olive Ridley, Leatherback and Green Turtles. Four children could ride on the back of a Leatherback turtle. Now there are very few turtles on the island and we would like to see more returning to nest here. Did many people on the island eat turtle eggs; did your family eat or sell eggs? Yes, when we were young all of the people on the island ate the eggs including us and our family. The people that lived in Thung Dap had the rights to the beach and concessions from the government to take the eggs. In the early days, they were eaten or sold in markets. Some of the nests were harvested but others were left to hatch so the turtles would reach the sea. At some point, money was offered for the turtle hatchlings. All the nests on the beach were moved during the night to one general location so they could be monitored and the hatchlings could be collected. These hatchlings were taken to the Phuket Marine Biology Centre where they were raised for one year then released back into the sea. They thought this would give the turtles a greater chance of survival since they would be larger, have fewer predators and be less likely to be caught in fishing nets. When did your view of turtles change from being a source of food to being an animal that needed protection? What caused this change in opinion? When we were about 5 years old our school took us to environmental education talks. There we learned the importance of turtle conservation and other environmental awareness issues. We attended these educational classes every year for about 10 years. Over that time we became more interested in saving turtles and making sure they would return to Koh Phra Thong. When did the turtle head start programme start here at Tha Pae Yoi? How does it work? The programme started 4 years ago when the two of us and a couple other men from the island went to the Department of Marine and Coastal Resources and asked for turtles to raise and release here on Koh Phra Thong. They bring the turtles here at 3 months of age and give us information about how to raise the turtles to about a year of age when they will be released. There are floating cages in the water made of nets that hold the turtles and they are separated by size. We receive a budget for things like building cages and a salary for one person. Researchers from Phuket Marine Biology centre come regularly to teach us about the turtles and how to deal with problems that occur. The main problems are when they first arrive, aggression causes wounds and bites that we treat with Betadine. We do not feed the turtles fish because it makes them aggressive. We feed them seagrass and algae instead. At first we were feeding the turtles too much which made them fat, off-set their balance and affected their ability to dive, and so now we are feeding them less and not every day. We release turtles from this side of the island and on the other side of the island from the beach. We think it is more dangerous to release them on the beach because the fishing nets are larger there and more likely to catch turtles in the nets. How many turtles do you have here and which islands did they come from? We have 73 turtles here now and they came from the Similan Islands; from island number nine which belongs to the royal navy of Thailand. We are not sure if the turtles will come back here to nest or go back to the Similan Island where they were born. We think there is a 50\50 chance that they will come back to this island where they were released to lay their nest. We would like to raise turtles that were born here on Koh Phra Thong so that we know they will return here to lay their nests. We think turtles have a better chance of survival if they are raised here to a year of age and then released to the ocean. We know each turtle that we have here and each one has a name. We can recognize each one by their markings and they have different behaviours. We spend most of the day and night here with the turtles and can hear them come up to breath at night which is about every 4 hours. The young turtles need something to submerge under at night and the folds in the net are good for this. After the turtles are released they often come back here to visit us. Do you have any way to keep track of the turtles once they leave here, are they tagged? Yes, the turtles all have tags and the numbers for the turtles released on Koh Phra Thong start at 5,000. Each turtle also has a microchip in their left shoulder which can be scanned and give information about which turtle it is and when and where it was released. How often do you release turtles and how many do you release at a time? When is your next release? We release turtles on special occasions, for Tsunami Memorial Day which is December 26th and Thailand’s Elders day which is in April. We usually release about 10-15 turtles at a time. Our next release is for Elders Day next month when we will release 15 turtles. This will be the 4th set of turtles we have released since the programme started 4 years ago. Is the community involved in the release? What do they think of this programme? Yes, the community helps release the turtles; they pick up the turtles and take them to the ocean. On Elders Day the older people of the village will be the ones releasing the turtles. We release turtles on these special days so the community can be involved and see the importance of allowing turtles to return to the sea. We want the view of the community to change from turtles being a source of food to being an animal that they want to protect. We think this change has already started and the villagers see the importance of our work. Now, when a fisherman finds a wounded turtle in a net he will bring it here so we can save the turtle and return it to the sea. What are your goals for the future of this turtle head start programme? 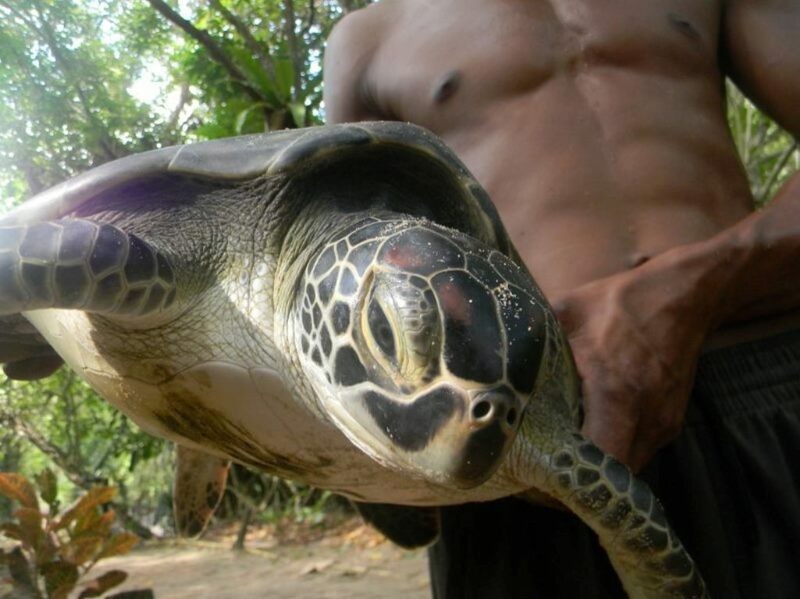 We want to continue the turtle project for the future and the rest of our lives on this island. We want to continue living here where we were born and prefer to keep doing this instead of becoming fisherman or working in a rubber plantation. We would like to build better cages for the turtles and we need more money in our budget to do that. We want more turtles to return to the island so our children can see turtles regularly like we did when we were young. We are passionate about our work here and think we are doing a very good thing for the turtles’ survival. Previous Post Five baby sun bears are rescued at the conservation centre in Borneo.